I may be a new Grandmom but I feel older and wiser. I used a few home remedies with my kids. Glad I have a second chance to use more with my granddaughter. Diaper rash creams most often contain zinc oxide. Zinc oxide is a harmless water insoluble powder that works well on baby's rash. But I've found a mixture of Tea Tree Oil and Coconut Oil works better. The recipe is so easy. Mix equal parts of Tea Tree Oil and Coconut Oil. Apply like any other diaper rash cream. Conveniently buy the ingredients now to help your little one be happy and healthy. 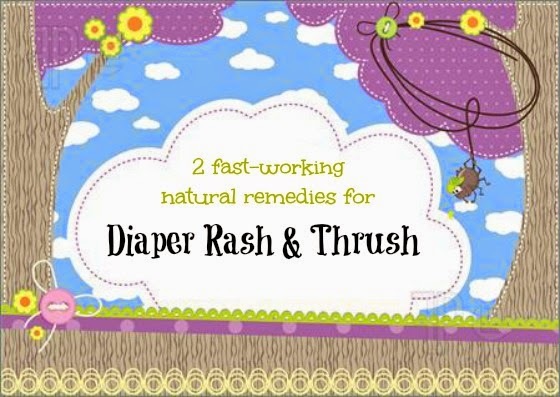 Be sure to check your baby's mouth for thrush whenever diaper rash is present. Your baby can get thrush at any time but they usually go hand-in-hand. What is thrush? According to WebMD, thrush is a yeast infection that causes white patches in the mouth and on the tongue. Your doctor may prescribe an anti-fungal such as Nystatin. A good natural home remedy for thrush is Grapefruit Seed Extract. Mix 10 drops Grapefruit Seed Extract with 1 oz. distilled water. Moisten cotton swab with mixture and apply to inside of baby's mouth 3 to 4 times daily where thrush is visible. I have provided a link to buy Grapefruit Seed Extract if you don't have it in your cabinet. I didn't. Disclaimer: I am not a doctor. This blog is for informational purposes only and not meant to diagnosis or imply cure. If your baby has diaper rash or thrush, please consult your pediatrician. Let me know how these recipes work for you and your baby. Leave me a comment.